Using Camtasia Studio I developed a tutorial video to help airport personnel become familiar with the mobile so they can better assist customers. A use of verbal instruction, text/annotation instruction, static images, and mobile app screen recordings were used. Content was then edited together into chapters and a text document manual was created to assist with this project. After a Epson smart projector was installed in a classroom, I was tasked with setting it up and then creating a manual to assist the teacher use the project in the easiest way that also fit the needs of her class. Through research and troubleshooting the issue preventing the projector from allowing smart pens to draw was resolved. A text document manual was then created with different use cases for the teacher. A recently started project. We’re currently working on an updated layout that doesn’t stray too far from the original site. A kind of revival project. Built with WordPress created using Page Builder. Per my agreement with the client, I’m not permitted to link to this site, but I can detail the skills I used and developed during this project. Product editing through Photoshop, custom CSS to make the template SquareSpace provided unique to the client, managing product variations as well as developing weekly Google Analytics reports for the client. Also provided custom HTML sections for information that needed a more custom touch. My entrepreneurial venture, besides my freelance. A small but growing Etsy store that is dedicated to self-expression and self-discovery. We’ve started off minimal with 1″ pinback buttons to aid in self-expression and affirmation origami stars to aid in self-discovery. Affirmation origami stars are small paper folded stars that when unraveled have a positive affirmation inside to help the user either start their day or get them through a hard time. We hope to add spray paint art and prints of that art next. Our goal is to gain enough traction on Etsy that we can divert that traffic to an eCommerce website. An info site is currently up in the meantime. This website is WordPress developed. I believe it is a great starting point and am very excited to expand upon it as my skills grow. As I was meeting more people and getting more opportunities, I needed a way to be remembered. 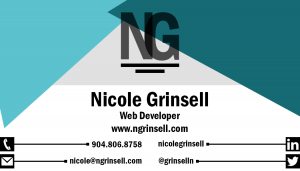 I ended up designing my own business card. Developing for Android has always been an interest area for me. It’s been a slow process and often shoved to the side for other projects, but I’m picking up concepts where I can! Aside from WordPress sites I really enjoy ground up development using grid frameworks or more sophisticated frameworks like Bootstrap. I’m hoping to complete a website using this method before the year (2017) is over instead of getting half way and starting a new one!